Last week my blog was featured on Good Morning America! I had the pleasure to make personalized lunches for three of the hosts and a few other GMA logo lunches. The great thing about these is that they are all simple enough for anyone to do and you can replace the names with whomever you are making the lunch for. Since my daughter is on summer break, I thought I would share the recipes for these lunches over the next couple weeks. But don't worry, there is plenty of other stuff in store as well! 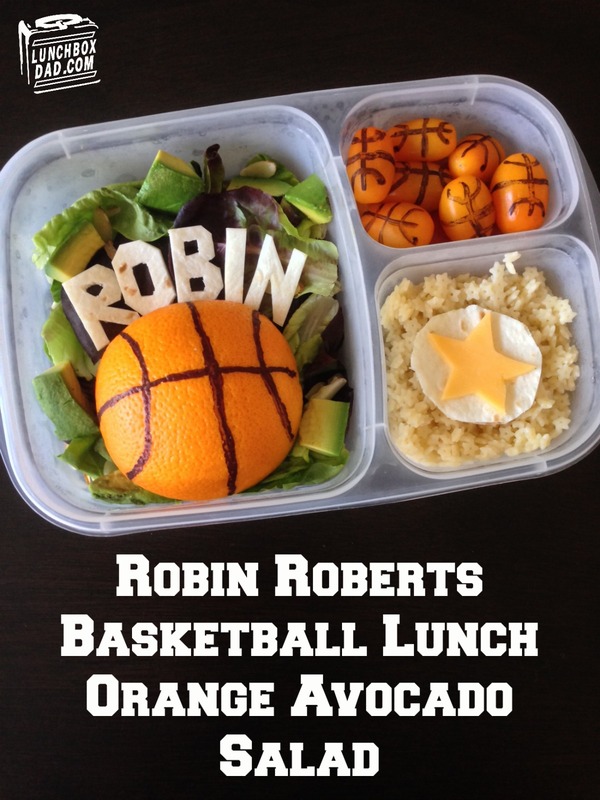 My daughter starts basketball camp today, so it is a perfect time to celebrate with this basketball lunch I made for Robin Roberts. 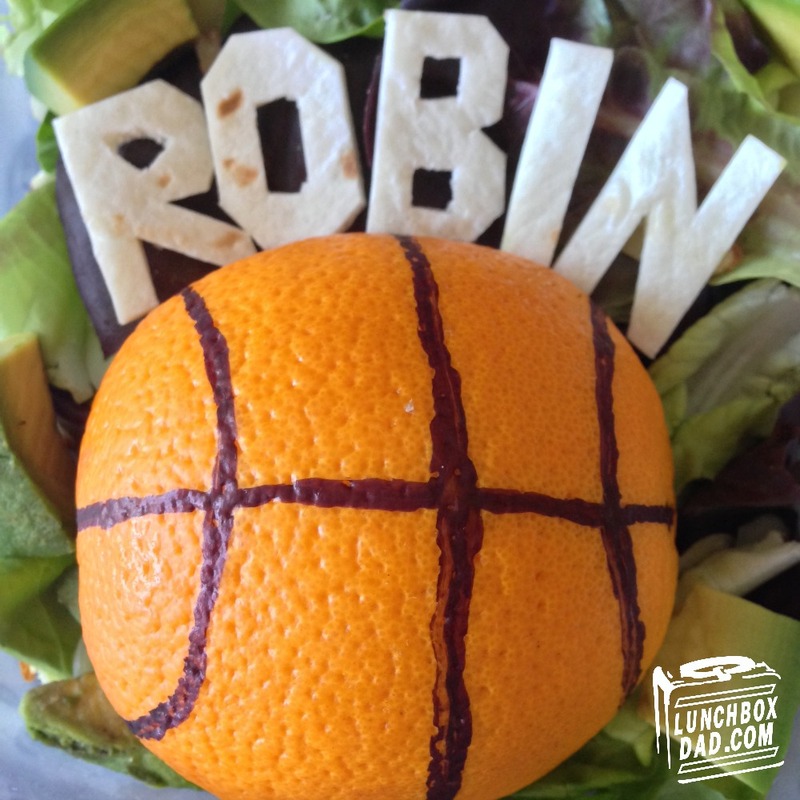 All you have to do to make it your own is switch "Robin" for the name of the person you are making the lunch for. This is made in an Easy Lunch Boxes container. 1. Cut orange in half and draw black basketball lines on the peel using black Sharpie marker. Because of the peel it wont leak through into the orange. You may use food coloring instead if desired. Arrange mixed greens salad in main compartment. Slice avocado into chunks and spread it and sliced almonds around mixed greens. Place orange on top. 2. Cut the letters for the name out of white flour tortilla as shown. Place above orange. 3. Cook star shaped pasta as directed on box. Let cool and put in side dish. Draw a star on a piece of paper and cut out. Place on top of cheddar cheese. Use paper to cut star shape from the cheese. Cut circle out of white tortilla and place star on top. Put this on top of the past once the pasta is cool. 4. If you have orange grape tomatoes use a black food coloring marker to draw basketball lines on them and place in second side dish. 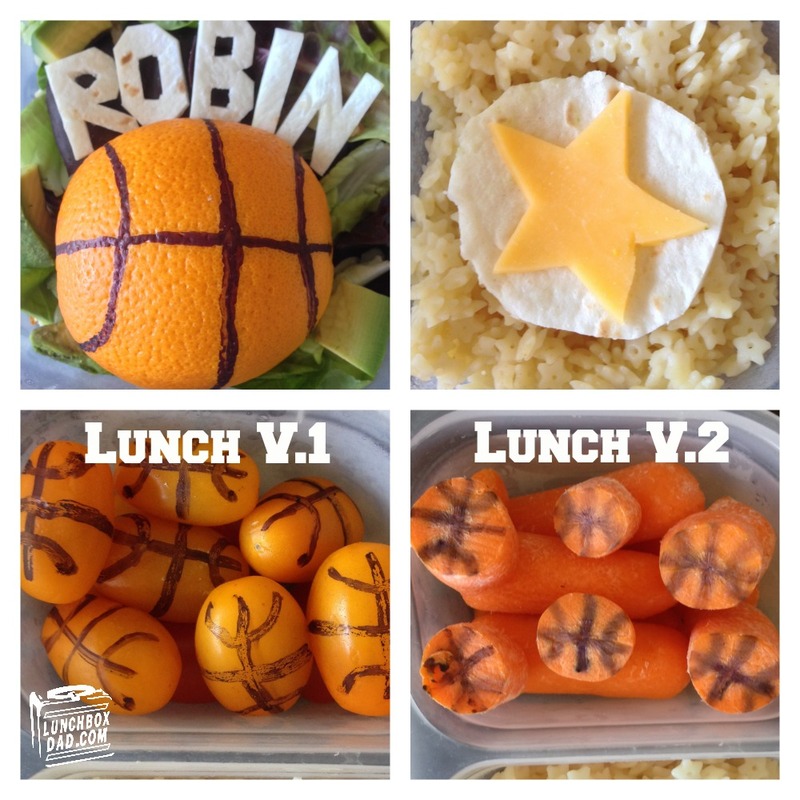 If you are using baby carrots instead, slice them up and draw basketball lines on them as shown and place in side dish. 5. Put a small amount of balsamic vinaigrette dressing in small container on the side for salad if desired.